The International Society for Minimally Invasive Spine Surgery (ISMISS) was inaugurated in 1988 by internationally recognized, innovative surgeons in the field of endoscopic and minimally invasive spine surgery, from Europe, North America and Asia. Since its inception, 34 conferences have been held, mostly in Zurich, Switzerland. 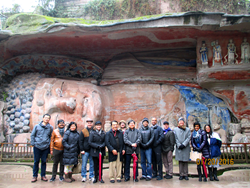 The last conference was held in Chongqing, China, on January 22nd, 2016. Three physicians from American Spine (AS) attended and presented papers on ground-breaking technologies to attendees of the 34th ISMISS Conference. Dr. Sandeep Sherlekar presented the paper entitled “Ambulatory Endoscopic Spine Surgery”. The paper described the range of endoscopic spine surgeries performed at American Spine Surgery Center (ASSC), including endoscopic decompression of the lumbar and cervical spine, and endoscopic decompression and fusion of thoracic and lumbar spine on an outpatient basis. The paper described innovative, endoscopically assisted trans-iliac decompression and fusion of the lumbosacral junction, pioneered by Dr. Said Osman and first performed at ASSC. Highlighted was a new intraoperative metric to determine the efficiency of any procedure performed at ASSC. The metric, AT/CT ratio is access time/cure time ratio to determine what proportion of the surgical time was used to access the diseased part and close the wound (access time) as compared with time used to actually remove the diseased part (cure time). The bigger the ratio the less efficient the procedure, because more time was spent opening and closing the wound than actually treating the disease! Dr. Said Osman presented two papers to the conference. Both papers described new MRI and CT scan based classification systems – one for the entire spinal segment and the other for disc abnormalities. The systems were developed by the AS doctors led by Dr. Osman. The purpose of the classifications was to give precise codes for any combination of the abnormalities of the affected segment of the spine and intervertebral disc, respectively. The codes are universally verifiable and reproducible. The idea was to make it possible for spine professionals, radiologists, general practitioners, other medical professionals and all interested parties to understand precisely what a report on the images means. Such a code provides a language which can be easily understood by all across the globe, and will make it easier to compare the outcomes of various surgical treatments for a given disease entity. Dr. Osman used the “Anatomic MIS Treatment-based classification of spinal motion-segment disease” to describe his new “Endoscopic Discectomy and Lamino-Foraminoplasty” technique, used to decompress the stenotic spine during an outpatient procedure at ASSC, instead of the conventional open surgery which normally requires hospital admission. Dr. Malik presented “Lumbar Intradiskal Platelet-Rich Plasma (PRP) Injections: A Retrospective Study” to the 34th ISMISS Conference. After disc surgery, post-operative bleeding at surgical site, inflammation of the nerves and postoperative pain are concerns, especially when endoscopic approaches are used. Platelet-rich Plasma, obtained from the patient’s own blood is known to reduce the risk of postoperative inflammation. PRP is also known to have analgesic effect and to help repair the tissues. For more information on American Spine news, please visit our website: http://www.americanspinemd.com or call #240.629.3939 to schedule an appointment. Or for personal attention, please contact Laurie Pantezzi of American Spine.